This week’s episode begins with a pretty good cold open, with Martin finding his way out of captivity with the help of the Riddler. 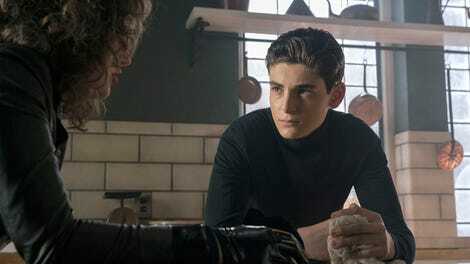 With Penguin and Riddler essentially a team again, they can focus on taking down Sofia Falcone. Everybody going after Sofia is the main story of the episode. Lee wants revenge, Gordon wants to atone for what he did, and both Penguin and Riddler have their own motivations for revenge. On paper it’s an interesting idea, showing how Sofia made too many enemies on her way to the top of the criminal element of Gotham, unlike her father, who was able to largely keep the peace. 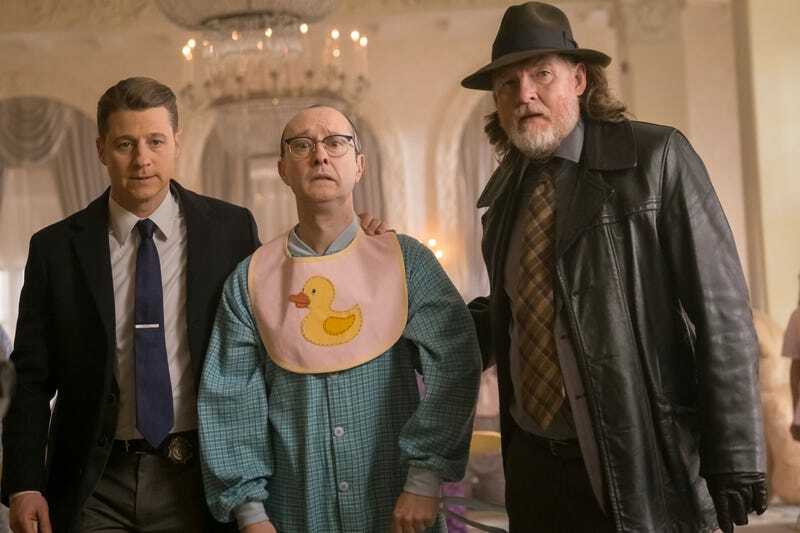 In execution though, Gotham fails to juggle all the storylines. It turns out that the “Scandinavian Skinner” isn’t a massive dude, but rather an old lady who owns a candy shop. The more you know! It’s great to see Bruce and Selina recapturing their old dynamic. I was going to criticize the show for smoothing over their issues too quickly, but the scene where they reconcile shows that resolving those feelings through some sort of long conversation just isn’t their style. Selina doesn’t have time for all that mushy stuff. It’s also good to see Bullock back with the GCPD, though his relationship with Gordon is still complicated. It looks like he’s never going to forgive his former partner for covering for Sofia, even at the end of the episode when Gordon is lucky to be alive. “A Dark Knight: The Sinking Ship, The Grand Applause” is overstuffed because of how many characters it needs to include in the story. There’s the major players like Penguin, Riddler, Gordon, Bullock, Thompkins, and Sofia, but then the episode expands to include check-ins with Barbara, Tabitha, and Butch, plus the remergnce of Martin, Mr. Penn, Zsasz, and Victor Fries, all of whom play a role in Sofia’s downfall. It’s way too much, and that’s without mentioning Bruce, Selina, and the talk about Ivy. Bullock even jokes about how nothing is ever easy because of how many people they have to track down just to find the one person they want. Bullock is subtly a TV critic. Gotham doesn’t always stage its action scenes well, but the pawn shop throwdown with Selina and Bruce is great. Looks like the Lazarus Pit is having its effects on Barbara. Speaking of which, the Ra’s al Ghul storyline feels like it happened years ago. It’ll be interesting to see how the show’s lengthy hiatus impacts the rest of the season. “Trust is so very hard to find in Gotham.” Penguin and Riddler are back together again, and that bodes well for Gotham. One of its very best dynamics. By the end of the episode Lee Thompkins is back in control of the Narrows, and she’s not messing around. She’s hammering hands like she’s Sofia Falcone. I’d say that the overstuffed episode is worth it because it closes out the rather underwhelming Sofia storyline, but that’s not really true. I literally shouted “NO!” at my TV when Bullock told Gordon that Sofia was in a coma after Lee shot her in the head.